Serena Williams set a milestone last weekend. To begin with, she won the 2017 Australian Open, defeating her sister Venus and making her 23rd Open title. 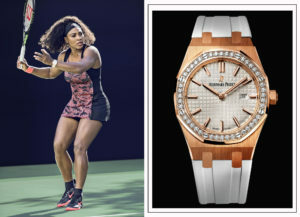 Williams took the win while wearing a stunning Audemars Piguet Millenary diamond watch on her wrist. 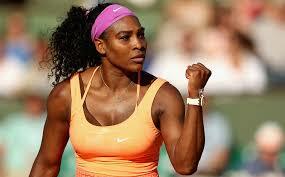 A long-time brand ambassador for Audemars Piguet, Williams is often seen sporting an Audemars Piguet on her wrist. During this Open, however, she even wore the watch during play. The solid 18-karat gold watch with diamonds on it may have been the good luck piece. Also of over the weekend, Roger Federer won the 2017 Australian Open men’s title wearing a Rolex GMT-MasterII watch. Also a long-time brand ambassador for Rolex, he is often seen wearing a host of different GMT watches by the brand. While he did not wear his watch during play, he donned it immediately after — just in time to claim the title. 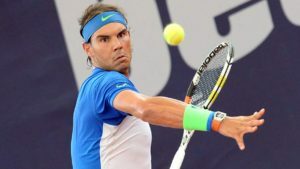 It is, by far, the most expensive wristwatch worn by anyone in the circuit ever: $800,000 for a 18 grams skeleton carbon watch made by Richard Mille for Rafael Nadal. The sweat bands he wears around his wrists weigh more than this watch! Novak Djokovic wears a Seiko Astron GPS Solar Dual Time: a classy watch for a versatile tennis player. Both parties of this collaboration feels strongly about the good match they make together. 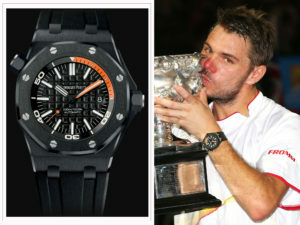 Stanislas Wawrinka wears an Audemars Piguet Royal Oak Offshore watch. A black ceramic case with anti-glare sapphire crystal covering an anthracite dial and a black rubber strap closed with a titanium pin buckle at this year’s Roland Garros winner’s wrist on court, for every match. Andy Murray wears a Rado Hyper Chrome Automatic Chronograph Match Point. 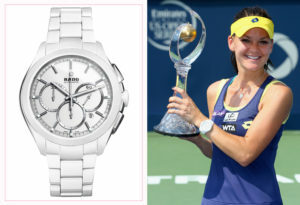 Agnieszka Radwanska wears a Rado Hyperchrome Automatic White. She always wears the brand’s Rado Esenza Touch Jubile in white, a touch controlled watch in full ceramic with four diamonds embedded white dial. Julia Goerges wears a Rado Hyperchrome Automatic White and Rado Hyperchrome S Quartz Jubile. She even keeps them on during play, which is something rather rare on the tennis court! Since the Hyperchrome Automatic White is specifically scratch-resistant and very comfortable, it seems a perfect choice for Julia who favors the clay and hard courts during the tennis season. Mark, is it true that all quartz movements are the same. I read that it costs the same to manufacture all quartz movements. That is definitely NOT true. High quality quartz watches come with better made, usually more accurate movements than inexpensive watches. Fabulas post! I am a biggest fan of Novak Djokovic & I loved reading about him and his favourite watch brand. Seiko Astron is a great watch. Fabulas information you have shared here. Many thanks.